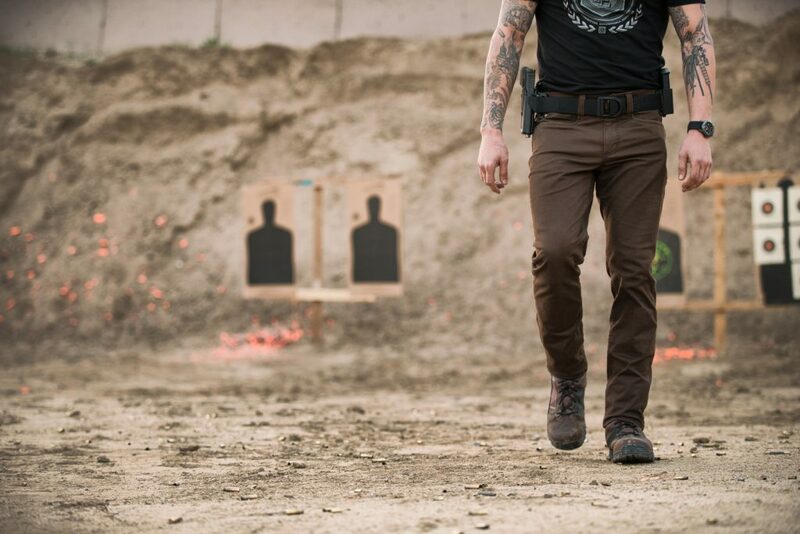 5.11 Tactical has owned the tactical pant market for some time now. Chances are you own at least one pair of their best-selling TacLite Pro pants if you're reading this. I have owned many pairs through the years. In fact the Khaki TacLite Pro (and only that particular one) is an option for the alternate uniform at the law enforcement agency at which I work. So my 5.11 pants typically start out as uniform pants until they get too grungy and torn to be acceptable for use on duty. Then they are relegated to casual wear around the house and trips to the store and then finally are retired as “range pants.” I'm wearing a pair right now as I type this. The classic tactical cargo pant isn't a one size fits all for everyone. Some people can't stand how they fit for them. For me they work fine. I like them, I'm used to them, and go ahead and call me a “tacticool mall ninja.” I wear them around in public, I don't really care. I am comfortable and I'm able to carry the EDC tools I require. But 5.11 is breaking out of that mold with their release of the 5.11 Defender Flex jeans (check out the review video below). Yes, JEANS I said! They're not exactly traditional denim as they have some stretch to them, but that is one of the beautiful features of these pants. I stopped wearing jeans years ago except for an occasional jaunt now and then. I had just grown tired of heavy, hot, tight pants that lacked pockets and storage for all of my EDC gear. And by “tight” I mean that the ability to bend down, crouch and squat has no comparison moving from a denim jean to a slightly baggy ripstop tactical pant. I also found myself wearing out the knees too quickly in my jeans. Anytime I would go to the range and work on tactical and defensive shooting drills, I would come back with visible wear to the knees. So I moved away from jeans and to the conspicuous 5.11's. But all kidding aside, I really was skeptical about the slim cut of these pants. I thought they would be terribly uncomfortable not giving me the room I needed to be free! Okay, I'm really done now with the jokes. I didn't think I would like the unfamiliar tightness. But that's where the stretchy fabric that these things are made of comes into play. Surprisingly it is incredibly easy to bend, jump, run, crouch, and otherwise be very active in these pants. I don't even really notice them when I'm going through drills and shooting in various uncomfortable positions. Honestly, I was shocked at how good they feel. To the point of almost convincing me to convert to these so-called skinny jeans. 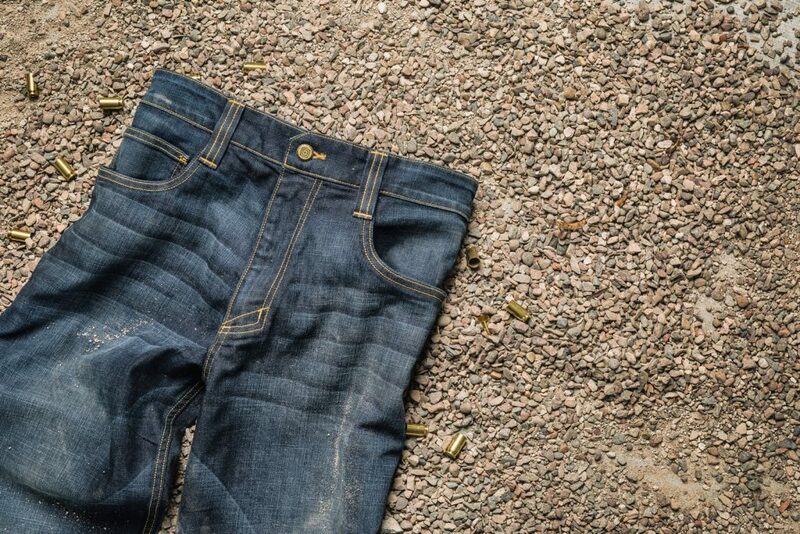 The good news is that 5.11 Tactical will be releasing shortly a boot cut/straight leg version of these pants. That should be the perfect combination for me. I think they will still look really good but have even more room and stretchability. I look forward to getting my hands on these ones as well and will report back once I do. One thing that is important to note is the fabric. It is not your typical yoga stretch pant material. This is 5.11 Tactical’s own cotton/poly blend that is what they call a “mechanical stretch”. The difference is that the material isn’t going to wear out like most elastic materials often do, it is like a bunch of little coils that allow the material to stretch and return back to shape thousands of times without compromise. The construction is top-notch with solid, double stitching throughout and in all the right places. The button is secure, and there's even nice touches like the chamfered corner of the overlapped material at the button that seems insignificant, but actually takes away any discomfort and bunching up that sometimes occurs just underneath the belt buckle. I haven't even talked about the best part yet though, and that is the pockets. The Defender Flex pants have 7 pockets. There are your standard front and back pockets in the usual spots. There's also the classic coin pocket just above and slightly inside the front right main pocket. But this coin pocket is full-depth. 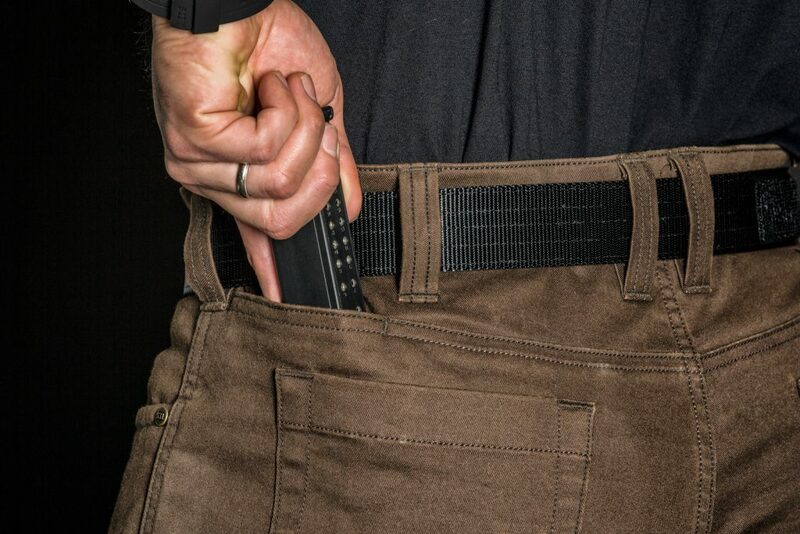 You could store a spare magazine of ammunition for any standard full-size pistol. That only accounts for 5 pockets though…the remaining pockets are two cleverly disguised and arguably hidden pockets that sit just slightly aft of your hips and right about even with the bottom of your belt line. These two pockets are deceptively large. They are perfect for flashlights or knives and are big enough for your cell phones including the iPhone 6/7 Plus models, although I cannot quite fit my iPhone 6+ with the Otter Box case on it. But even better, they are large enough to store a 30-round AR .223/5.56 magazine, so in theory you could carry 2 spare AR mags (one in each of those two pockets), a spare pistol mag in the “coin pocket,” and all of your other typical gear. Super cool! As you can see, I am able to carry all of this gear easily and comfortably and yet still be very concealed and inconspicuous. No one is the wiser as to the arsenal of firepower on my hip and in my pockets. I even tried out carrying a spare 33-round Glock mag in one of those hidden hip pockets, and it worked great. It is pretty reassuring knowing I can carry my Glock 19 with 49 total rounds for defense, not that I think I would ever need that many rounds in a typical encounter, but I do believe in being prepared. Plan for the worst, hope for the best! I have been wearing these pants for about two and a half months now a couple of times per week, and so far they seem to be holding up just fine. They have been through DOZENS of washes, and I was a little worried that the stretchy denim-looking fabric wouldn't hold up to daily use and abuse, but they seem to be about on par with any of my normal denim jeans. Of course, only time will tell, and if I have any updates for you on the durability of these pants, I will be sure to report back. In the video Riley mentions 5.11 says they are shipping in May. Yeah, I talked with them again at the NRA Convention, and they weren’t looking like they were going to be quite ready by this month. I got conflicting information from a couple of people at the 5.11 booth. I’m looking to get a more firm clarification from them soon. now, how much are they? Sorry for not mentioning it in the video…MSRP is $69.99. I have these jeans although I don’t think they’re skinny jeans. I bought them from Tacticalgear.com. I like them, but a couple of things I don’t like: the two front pockets are not very deep at all. They are considerably more shallow than any jeans I’ve ever had. My cell phone won’t even fit down in them completely. The other thing I dislike is the short fly. If you have a pair ( no pun intended) then you know what I’m talking about. You almost have to undo the jeans and pull them down to pee. If they would improve those two things, then I’d be completely satisfied with them. The ones I initially reviewed were the skinny fit ones. 5.11 Tactical had not yet released the straight leg version at the time I wrote the review. Since then though I have worn nothing but the straight leg ones. I really like them. I have heard others comment about the shallow depth of the front pockets. I’ve never really been bothered by it, but I also don’t carry my phone in the front pocket. As for the fly…I never considered this factor. I guess because it’s never been an issue. Apparently, I am not “well endowed!” LOL! Or if you have a 5.11 Tactical store near you (they’re opening new locations all the time–like 1-2 new stores each month), you can buy them in store. What boots are you wearing in the photo below “Styling & Fit”? Chris, I’m sorry, I don’t know which boots those are as this image is one that was provided by 5.11 Tactical.